The remake of the original Oscar-winning film Fame opens today! 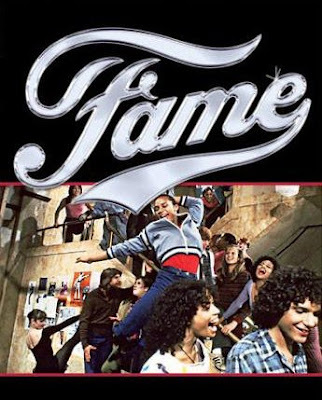 This movie which is based on a group of students, who are also dancers, actors, singers, and artists at The New York City High School of Performing Arts...has a special place in my heart because I am a graduate of this school. I was a Drama major at Performing Arts...and have to say- while we DID NOT dance on the cafeteria tables like they do in the movie- it was the best four years of my life! I made great friends in high school, and although our school is a big specialized/ public school, it did have a family environment. Yes, I know this will probably be a corny movie, but I am still going to jet set to see it...and if any of my high school friends are reading this...consider this an invitation! :-) "Baby remember my name!" I did however, as a dance major walk around in my unitard! Remember the fire drills when everyone was out of the building but the dance majors because they were on the 8th floor would be the last to exit and we used to always get applause as we walked out of the building. Haha, great times at LaG. Best years of my life as well.